Does your home need to Smart? If Smart Devices are not what you need, they could well be what you want. Smart devices are definitely the future. Here’s a round-up of gadgets you might need/want to install. Smart speakers. Systems like the Amazon Echo use an in-built microphone to listen to your voice commands. Ask ‘Alexa’ the Echo’s virtual assistant and ‘she’ will forecast the weather, relate the latest sports scores, convert pounds to kilograms, but more tellingly serve as a voice-controlled hub for your other smart gear. Other smart speakers exist, but the Amazon Echo Dot is a really good cheap start-off system. None of the smart speakers on the market are hi-fi quality, but the Dot can communicate with your superior hi-fi system. Smart thermostats talk to your boiler and can control radiators and water heating so that they can switch to an Away mode when you leave the house, saving you money. Or they can be controlled remotely via your smartphone. The thermostat can suggest when to turn the heating down and will email you a monthly energy summary. A great environment and energy bill-slasher. Smart tech offers a real benefit in security, giving you access to live feeds from cameras, cloud storage of footage, and even the potential for smart locks to govern who gets in and out. Netatmo and Netgear make great smart security cameras, but the Y-Cam Evo stands out as the best all-round indoor home security camera on sale due to a combination of hardware, software and free seven-day cloud recording. Smart lights are cool and fun. Most modern systems let you set brightness, tone and colour, and control your bulbs with voice commands. The Philips Hue Ambiance Starter Kit gives you a choice of 16 million colours. Schedule the lights to turn on and off at certain times of day or when you enter or leave the house. Vacuum cleaners. Not quite as effective as traditional cleaners, but they can work methodically around your home, capable of negotiating the slightest obstacles. Dyson comes up with an App which allows you to schedule when you want your robot to start cleaning. It will in turn let you know where it’s cleaned and where it hasn’t. There are countless other devices out there to discover too, from smart plugs, to coffee machines and smart toothbrushes. If you need professional help installing your devices and you’re local, we are EJS Electricals, Swindon Electricians. Give us a call. Carrying out your own electrical work at home can cut corners, but at what cost? Safety is an obvious issue. Electricity is extremely dangerous. It can kill. But there can often be a greater financial cost later on in rectifying a bodged DIY job that could have been avoided if a professional electrician had been hired in the first instance. Be reassured that if you’re looking for professional electricians in Swindon, we are always on hand. A lot of people are happy replacing a faulty fuse in a plug. It’s a straightforward job, but you should never interfere with the actual plug socket. If your sockets have experienced some form of damage, you need to call a professional. The more ambitious might try their hand at smaller projects such as installing light switches and light fittings, wall lights etc. ; jobs that you might think too expensive to have done by an electrician. But often it’s the case that an electrician is called out to fix a simple job turned into a nightmare. 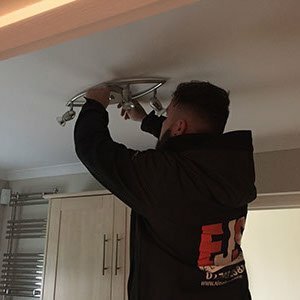 To rectify faulty wiring that has been caused by the homeowner attempting to carry out the job themselves, damaged light fittings, damaged cables and switches. And in some cases electrical accessories have been known to catch on fire. If you are working on home improvements, you may want to look at replacing the electrics in your house. This needs to be carried out safely and you should seek advice from an electrician. If you’re seeking it from electricians in Swindon, do give us a call. We are often called by homeowners who have carried out repairs asking for us to certificate their own electrical work. Unfortunately we can’t do it. The work needs to be carried out by a professional from the outset. As a homeowner you are entitled to carry out any electrical works in your home. But, be advised that you will be asked to present all the certification for the electrical work carried out if you ever move or rent your property. You cannot obtain the appropriate certification following your own installation of electrical work at a later stage. If someone is injured or a property is damaged your insurance will be invalid if you do not have the appropriate certification to prove the system is safe. 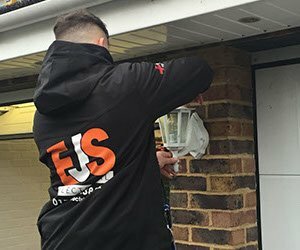 If you want the job done quickly and properly, look no further than EJS for professional electricians in Swindon.